Tecnoplast, crossing boundaries. New partnership with the indian magazine POLYMERS Communiqué. During the recently concluded CHINAPLAS 2018, was a cherished moment for us… Italy met India in China! Tecnoplast aligned with one of the most high-profile magazine for the Indian plastics industry: POLYMERS Communiqué. 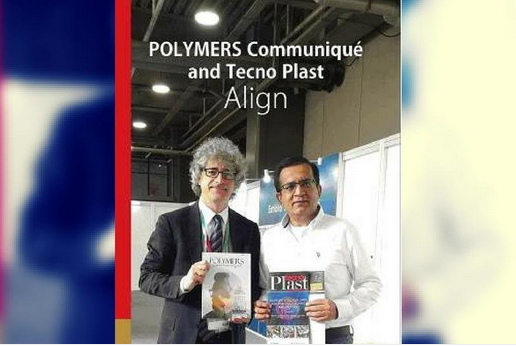 It was a casual interaction between Manish Chawla, Publisher POLYMERS Communiqué, and Marco Mastrosanti (Editor-in-Chief and owner of Tecnoplast) that accidently began when they were sitting next to each other during a press meet at CHINAPLAS 2018. The coming days of the event saw them interacting over varied issues, when they realised that a lot of similarity existed between the two setups. We would like to offer the extended communication platform in POLYMERS Communiqué to Italian companies who remain interested in India. Tecnoplast offers a good mix of technical and economic news. It focuses on market trends and innovations in machinery, components, materials and processing systems. POLYMERS Communiqué has the same business objective and India is becoming a more and more important market for plastic industry. We are pleased to announce that POLYMERS Communiqué and TecnoPlast have aligned with an objective to further our value proposition in respective markets.